Hesitation is when flow slows down or stops along a particular flow path. If plastic filling a cavity has the option of filling either a thin section or a thick section, the plastic will tend to fill the thick section first as this route offers less resistance to flow. This can result in plastic in the thin section stopping or slowing significantly. Once the plastic starts to slow down, it will cool more rapidly, so the viscosity will increase. This higher viscosity will inhibit flow further causing even faster cooling and so the problem is self propagating. Hesitation can occur in ribs and in thin section of parts that have significant changes in wall thickness. 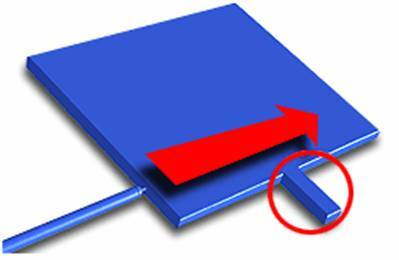 In the image above, the rib circled in red, offers a higher resistance to flow because it is much thinner than the rest of the part. Look at these animations to see how hesitation in a part can be avoided by using a different injection location. When there is no alternative route available, the flow in the rib will be continuous and not hesitate as seen in the right-hand example. Hesitation can reduce part quality due to variation in surface appearance, poor packing, high stresses and non-uniform orientation of the plastic molecules. Alternatively, if the hesitation allows the flow front to freeze completely, part of the cavity may remain unfilled (short shot). Viewing the fill time and temperature results may help explain why the hesitation occurred. The fill time plot will show hesitation by a very narrow spacing of fill time contours. The temperature plot will show hesitation by a low temperature and a large temperature gradient. Note: Hesitation can lead to asymmetrical and unpredictable flow patterns. Move the polymer injection location away from the area of hesitation so that the bulk of the cavity fills before the melt reaches the thin area. The absence of alternative flow paths will give less time for the polymer to hesitate. Move the polymer injection location to a place that will cause greater pressure to be applied where the hesitation occurred. It is useful to have thin ribs/bosses as the last point to fill, so all the injection pressure is applied at this point. Increase the wall thickness where the hesitation occurred, to reduce the resistance to flow. Use a less viscous material (that is, a material with a higher melt flow index). Inject more quickly to reduce the potential of hesitation time. Increase the melt temp so that it flows into the thin area more readily.